On some days, nothing succeeds. Everything I painted I had to wipe off because I lost my artistic mojo. When I took a comforting cookie, I bit hard on the inside of my cheek. When I walked to the mirror in tears I discovered the wet laundry has been sitting in the washing machine for 2 days … and in the hallway I found a trail cat litter on the carpet because of a leaking trash bag earlier that day. Then you can do two things. Or save the rest of the day for tomorrow. Or start buying things. Men often choose to buy a nice stereo. Women choose for clothes. Only if you are 2 victims together, than maybe something more original is resulting. Eventually we purchased a worm farm. I guess because of the education we got from the Dutch government. For us it was quite normal already, to separate the waste. New Zealanders were only just begun. We recently got a green and gray wheelie bin and the council still sways with the educational finger on what kind of trash we have to put in which bin. But we were thoroughly educated already. We threw our kitchen waste in the green bin. Simple. But that was not the intention!!! Because then the green garbage would start to … smell. And the intention is that only the grey garbage stinks. With the green landfill as well as the grey landfill nothing is done. They are just being there. Because we didn’t understand the goal of it, we separated the waste anyway, but at the same time we were offended that no one was grateful for our effort. In fact; we did something wrong that was not wrong! 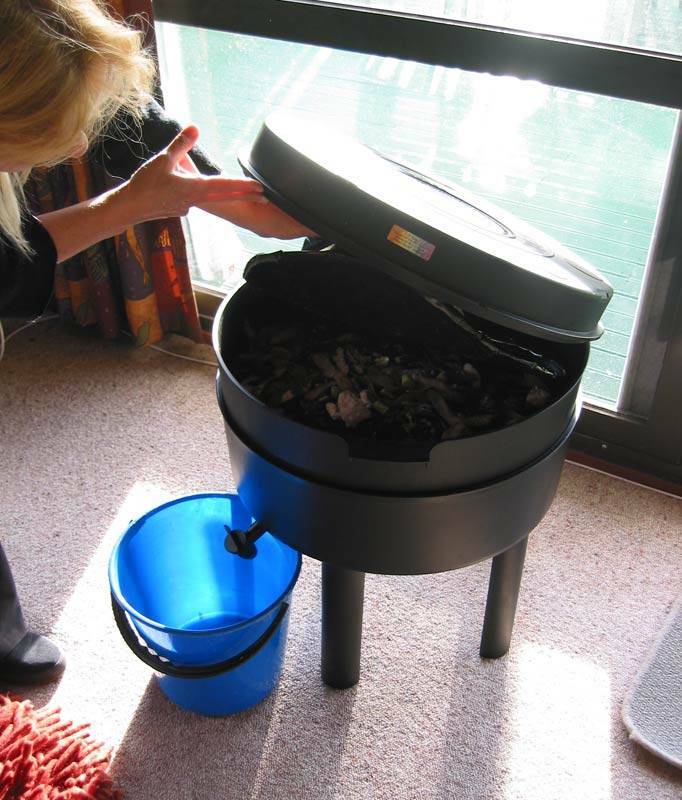 Even more; the landlady who occasionally makes a kind of inspection around the house, taught us that the inside of the green bin became … dirty. And we had to clean it. Really? Yes, she was serious. This is only one floor. And … actually they shouldn’t be in our living room. And so, that day we went to a farm whose owner is much more self-sufficient as we will ever dare, and we bought a big plastic kit and a pound of worms. Fun for all ages, said the sticker on the wrapping. At home we have put together the worms flat of 3 floors and released the worms into the lowest level. Now every day we throw a little bucket of apple cores and peels into the worm house and fertile soil comes out. In fact the fertile soil is worm-poo. I’m happy to see my new pets are glad with my waste effort. I even cut the waste in small pieces and try to give them some variation every day. This entry was posted on 24 October 2006, in PERSONAL LIFE POSTS and tagged life in new zealand. So first I will check out the artists that this gallery has mentioned on the website and find out what are the average prices. It may sound pretentious, but I’m on a certain price level where it doesn’t make sense to exhibit my work on a wrong market place. Because in New Zealand distances are way more serious than in the Netherlands, New Zealanders more often are away from home for a few days. Our neighbor owns 6 chickens, which we occasionally feed when he has to travel. At a later stage our ‘collected chicken-points’ are exchangeable for cat favors. Lately the neighbour chickens are coming over to our garden daily, for our special attraction. Among the random objects belonging to our rented house is a stainless steel shower base. It is sitting against the fence for ages, partly overgrown, hardly noticed anymore. 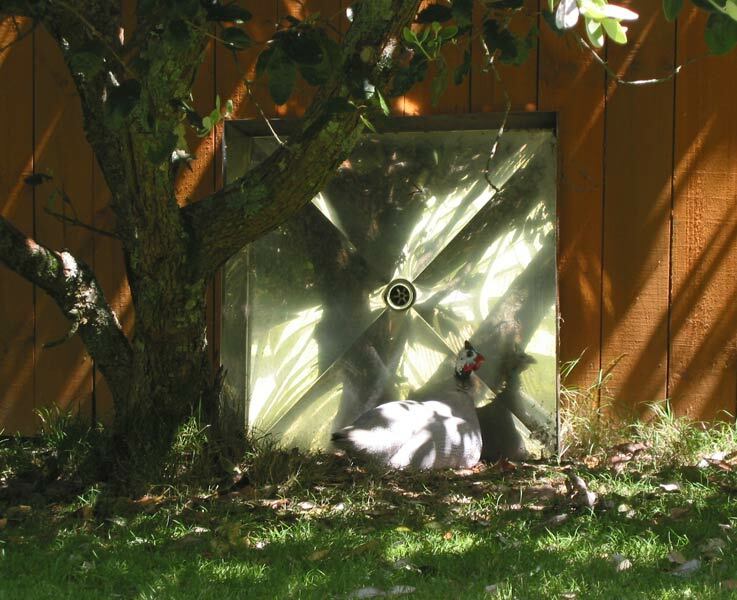 Now the chickens have discovered this thing and they can see themselves in the shiny steel. Each time this happen they are over the moon of enthusiasm. Every afternoon they are standing in front of this steel shower base overly exited about this phenomenon. Not until dinner time, they jump back home, over the fence one by one. Totally bewildered about what humans are inventing nowadays. The chicken in the picture was lingering on purpose, so she could have a private talk with her stainless steel sister. This entry was posted on 20 October 2006, in PERSONAL LIFE POSTS and tagged behind the scenes.